It’s got 6 legs but it’s not an insect! Q. When is an animal with six legs not an insect? A. When it’s an entognathous hexapod. Until fairly recently it was thought that all animals with six legs were insects. It is now widely accepted that there are two classes of six-legged animals – the insects (class Insecta) and the entognathous hexapods (class Entognatha). The Entognatha are six-legged animals characterized by mouthparts which are hidden away in a pouch in their head (entognathous). The insects (Insecta) have mouthparts which are not hidden (ectognathous). [stextbox id=”info”]HEXAPOD Noun. (Greek, hex = six + pous = foot.) Any 6-legged arthropod. ENTOGNATHOUS Adj. (Greek, entos = within, inner + gnathos = jaw + Latin, –osus = with property of.) Hexapods with mouthparts recessed within head. The class Entognatha contains three orders: Collembola (springtails), Protura and Diplura. As well as recessed mouthparts these three orders have a few other things in common. They are all wingless (apterous). Also there is no visible change in form between the life cycle stages other than in size, meaning they don’t go through a process of metamorphosis and so are termed ‘ametabolous’. The largest of these orders is Collembola, the springtails. There may be as many as 2000 species in Australia, many of them undescribed. They are called springtails because they have a prong at the tip of their abdomen (known as a furca) that is folded back like a spring. When released, the individual is launched into the air. You can see the furca in the image below. Springtails are usually tiny animals about 1mm to 3 mm long. Almost all springtails are considered beneficial species because they contribute to the breakdown of organic matter. 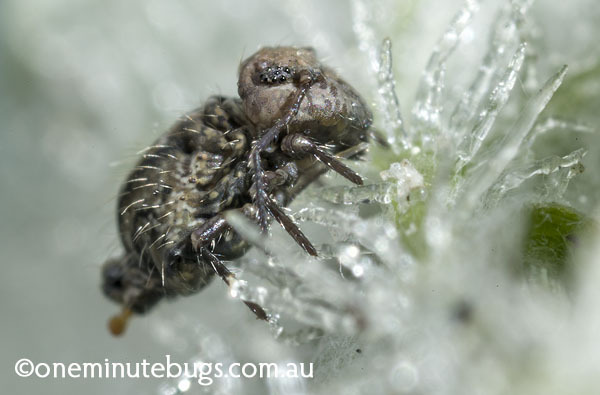 There is one pest species in Australia and that is the so-called lucerne flea (Sminthuris viridis) which may damage emerging seedlings. Springtails don’t have eyes as such, instead they have a cluster of light sensing organs (known as ocelli) on each side of the head. 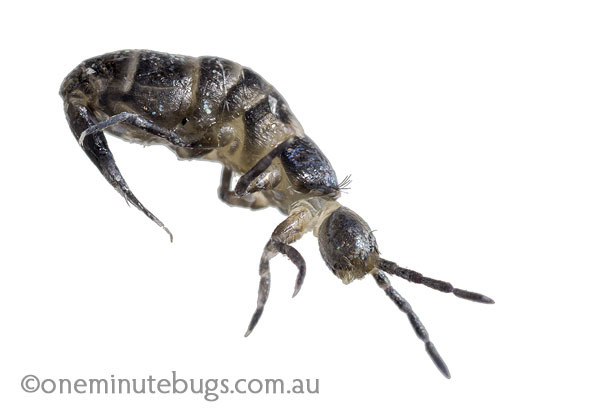 You can see ocelli on the side of the head of the super cute springtail in the image below. Protura are rarely seen, tiny (< 2 mm long), pale, hexapods which may occur in soil, leaf litter, decaying wood and moss. There are about 30 described species in Australia. They have no eyes or antennae and hold their front legs forward apparently to feel their way around. Proturans were not described until 1907 and to this day very little is known about their behaviour. Some species have been observed feeding on mycorrhizal fungi, but it remains to be seen if all Proturans feed exclusively on mycorrhizal fungi. The line drawing below comes from CSIRO. There are 31 described species in the order Diplura which occur in Australia. They vary greatly in form and size from pale delicate hexapods less than 5 mm in length to robust earwig-like species which may reach 50 mm in length. Diplurans have no eyes but do have a pair of antennae. They also have a pair of abdominal appendages known as cerci which are filamentous in the families Campodeidae and Projapygidae, but pincer-like in the families Japygidae, Heterojapygidae and Parajapygidae. Diplurans of the families Campodeidae and Parajapygidae appear to be herbivorous, Projapygidae may be omnivorous, while the rest appear to be carnivorous. Heterojapyx (picture below) is certainly carnivorous. It waits buried in soil with only its pincers (forceps) above the surface, ready to grab any unsuspecting prey wandering by. 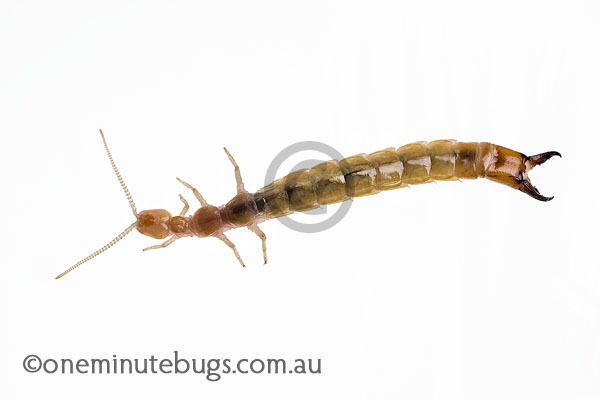 Superficially it may resemble an earwig, but the lack of eyes and wings gives it away. I had never seen one of these in the flesh until recently when I stumbled upon one while chopping wood on my property. What a find! This entry was posted in Entognatha, Hexapod, predator and tagged Collembola, Diplura, ectoganthous, Protura, springtail by denisjc. Bookmark the permalink. I found this article so enlightening however i was wondering whether these species are studied in entomology as are insects? Are there any species of entognatha that are of medical importance? Yes, they are usually included in entomology. As far as I know there are no entognatha of medical importance. It is interesting the way you title the article. Until the erection of the subphylum hexapoda and class entognatha, class insecta also contained these orders, ie protura, diplura, thysanura (now redundant) and collembola, all grouped under subclass apterygota. In other words they were considered as insects. That’s why entomology classes still teach them. Yes that’s absolutely correct. In fact most of my textbooks have them listed as “insects”. Thanks for your comment. ← Previous Previous post: The Rain Moths are back! Hi. I'm Denis Crawford. Welcome to my blog "one minute bugs". Here you will find text pieces about insects which you can read in about one minute, and occasional videos about insects which run for about one minute. "GARDEN PESTS, DISEASES & GOOD BUGS: The Ultimate Illustrated Guide for Australian Gardeners"
I have a substantial collection of insect images on Alamy available for sale. OR contact me directly with your image requests. Copyright © 2019 one minute bugs. All Rights Reserved.